Since I came back to Myanmar last year, I have been attending the same church where I was baptized on Insein seminary hill. Amazingly enough a lot within the church building - the pews, the lightings, the banner, etc. - have remained the same for the past 25 years! However, the one noticeable transformation is a beautiful choir music by seminary students. The beautiful voices, nicely arranged music, a polished piano all add to a wonderful worship experience. The person in charge of the choir is my childhood friend Thramu Ta Mla Paw Meh, who is the head of Church Music Department (CMD) at Karen Baptist Theological Seminary (KBTS). Some of you may recall that FOB has supported her and her department periodically in the past. 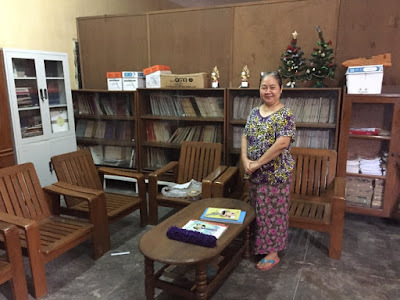 One weekend afternoon I decided to visit my longtime friend Thramu Ta Mla Paw Meh and her program.